Three is never a crowd. Totems and fashionistas, snazzy outfits and pages of crafting materials. Welcome to the new world of Zelda! Tri Force Heroes slides away from Link's traditional single player stylings in favor of a cooperative loot gathering, puzzle solving experience. One part Legend of Zelda, one part dungeon crawler, and one part friendship. But not in a lame way. 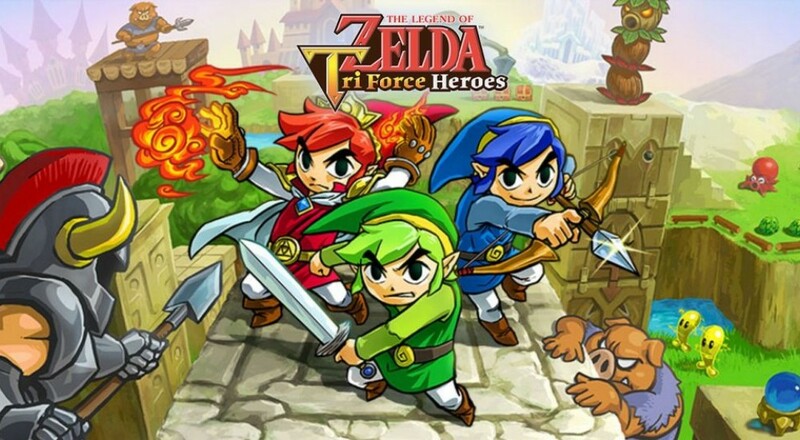 Like its namesake suggests, Tri Force Heroes is a Legend of Zelda game at its core. You control Link, that guy with a sword, and get to use all sorts of familiar items to push blocks, trigger crystals, and defeat enemies. 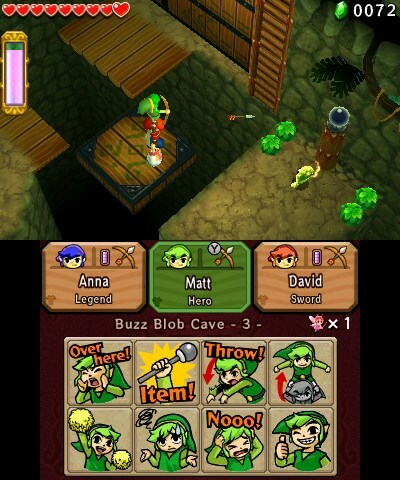 Instead of a long story adventure to complete, Tri Force Heroes breaks things down into groups of dungeons, each designed for short sessions with co-op adventurers. Start the level, pick up the dungeon's item, fight to the end, and collect your prize. Then it's back to the lobby to do it all over again! The central focus of Tri Force Heroes is creating and equipping outfits. People in this strange Hyrule-adjacent world are obsessed with looks, so much so that their entire society is based on who's wearing what. Because you're the vaunted hero, you get to wear many different hats (and shoes, and trousers, and shirts). Each outfit grants you a new ability, like firing three arrows at once or tossing mega bombs instead of boring regular bombs. To create these outfits you need raw materials, and to get materials, you need to beat dungeons. You won't always get the item you need when completing a stage, so get ready to do some grinding for that shiny new dress. Yes, Link wears dresses. Puzzles in Tri Force Heroes are designed for three players, and more often than not you'll need to deploy the game's signature totem to reach that solution. Totems are stacks of Links two or three high, and they let you access switches, enemies and targets at different heights. Got something shooting at you from atop a pillar? Pick up your co-op pals and show it who's boss. The person at the bottom of the totem controls movement, the person on the top can use his or her weapon, and the person in the middle gets to sit there and watch. 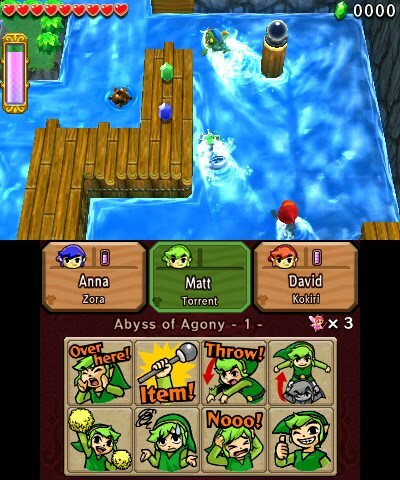 Technically, Tri Force Heroes has a single player mode alongside its main co-op feature. Instead of you and two human friends, you control Link and two dolls, switching between them to build totems and solve puzzles. Swapping back and forth ends up being pretty tedious, so much so that it's not worth the trouble. If you can't go co-op, don't go at all.